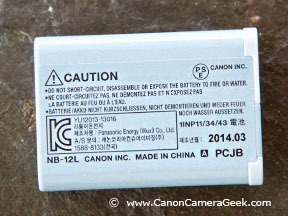 The official Canon G1x Mark II Battery is the NB-12L, a 3.6 volt, 1910mah power source that has come under some criticism, and with good reason. 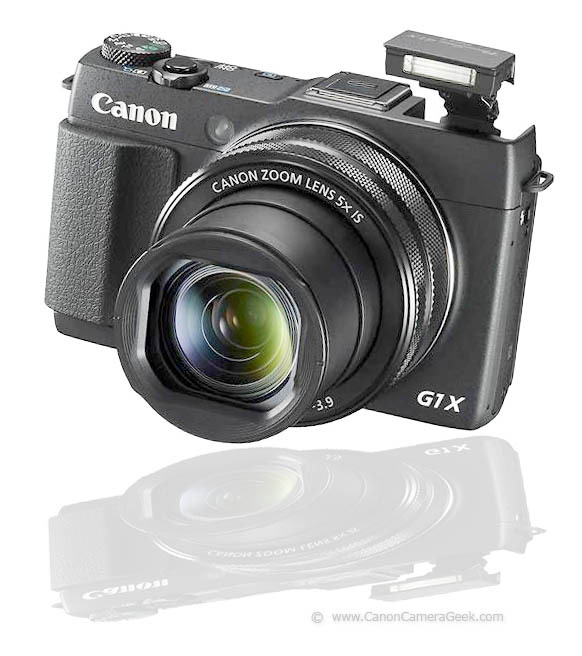 Canon wanted to keep the G1x Mark II small, similar to the traditional, fit-in-the-pocket design of the common point and shoot camera. They included a really big sensor in the Mark II and all its required space-eating circuitry and accompanying lens. That put severe pressure to save space inside the camera any way they could. The result is a smaller battery with less capacity. When I bought my new G1x Mark II, I ordered a second NB-12L battery. I read all the reviews. I looked at the battery specs. I knew that the G1x Mark II wouldn't win an award for power capacity. I am not going to shoot any of my commercial jobs with the G1x Mark II, but I may take it on a backpacking trip, away from electricity and the ability to re-charge a battery. I decided I wasn't going to let a wimpy battery get in the way of having fun with a new camera, but I think it's going to be something that Canon will definitely look at in future versions of this camera. 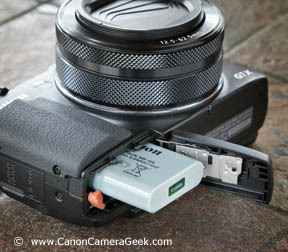 A spare battery is one of those absolute must-have camera accessories that should be a priority with every digital camera you own. If you need to do a photos shoot that lasts all day, you need to have spare batteries or get a different camera. This camera isn't perfect, but I have never been introduced to a perfect camera yet. I still really wanted the G1x Mark II because of its sensor size and it's lens re-desing over the original G1x. The batteries really are quite small. They are easily loaded into the camera from the bottom and will only go fully inward by facing them the right way. The SD memory cards are conveniently accessed through the same drop door. It's only a hassle if you have your Mark II mounted on a tripod or flash bracket. The CB-2LG battery charger is smaller than a deck of playing cards. It plugs directly into an AC outlet without a power cord and has the folding prongs for compact storage, It charges an empty NB-12L battery in about 3 hours. 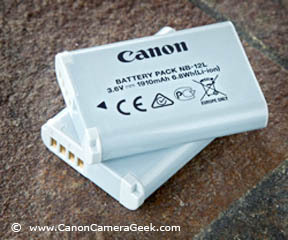 Here is a size comparison between the G1x Markk II battery and the battery of the Canon G11 camera. The outside dimensions of these two cameras are somewhat similar. 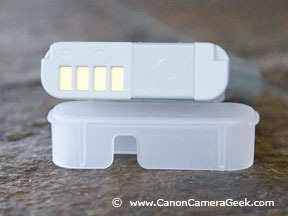 The G11 battery is about twice the size of the G1x's battery. The size of the sensors and the lenses are the two big external differences between the two cameras. 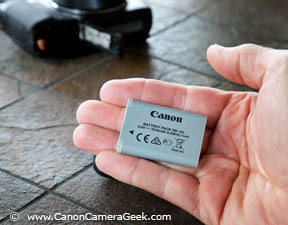 You can see in the photo above how much bigger the G11 battery is compared to the Canon G1X Mark II Battery. 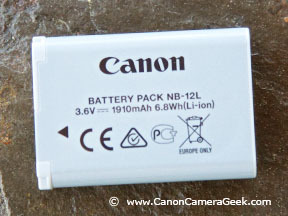 Up until I purchased the Mark II, I used my Canon G11 as my point and shoot camera and I can tell you the G11's NB-7L batteries last a long, long time. 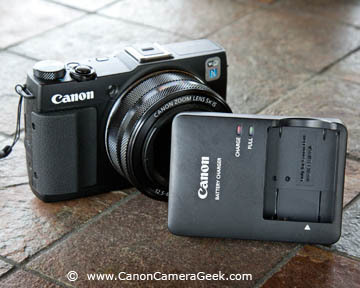 Here is a size comparison of the G1X Mark II vs. G11 Cameras. 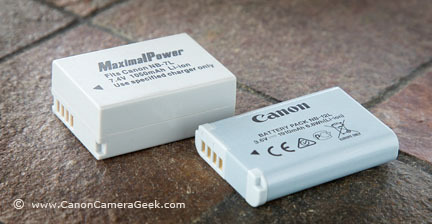 If you like this article on the Canon G1x Mark II battery please share it with a friend.